There will never be another. 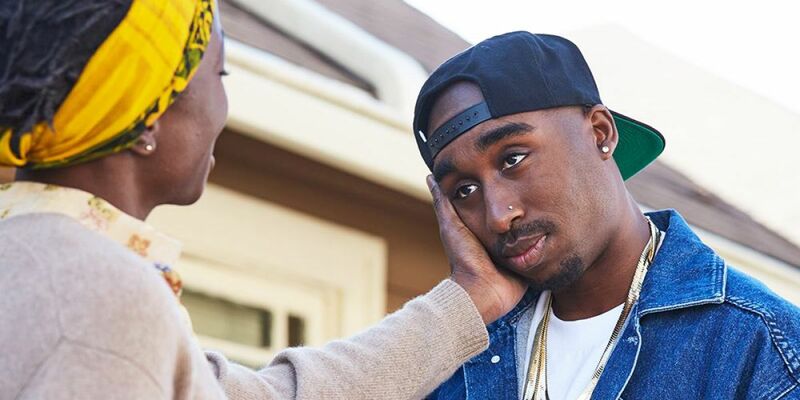 At an early age, Tupac Amaru Shakur (Demetrius Shipp, Jr) is exposed to a lot—both good and bad—that would eventually shape him into the man he would become. The son of Black Panther party members, Tupac was always given an honest depiction of the world from his mother, Afeni (Danai Gurira). Afeni encouraged her son to get into the arts, which included acting, poetry, and music. His move from inner-city Baltimore into inner-city Bay Area, California sparks his foray into rap music, first as a member of Digital Underground, then as a solo act. As 2pac, he quickly becomes one of the greatest and most influential artists ever. But his rise isn’t without controversy, nor does it end without an untimely demise. Most, if not all rapheads, would agree that 2pac is forever entrenched as one of the top five emcees of all time, if not the greatest one to ever do it. His 25 years on this Earth, short as they were, were filled with momentous incidents and cultural significance that hit at the many layers of the legendary rapper. All of that should make for at least a solid, if not fascinating, biographical drama, correct? Some of the moments in All Eyez on Me are there, but the overall total execution often isn’t. From a narrative perspective in All Eyez on Me, ‘Pac’s life is told to an interviewer (Hill Harper) while in prison, from his birth until his eventual bailout by Death Row Records mogul Suge Knight (played by Dominic L. Santana, in a role written with little subtlety). This takes up about a half or so of the movie, but it is not a bad way for director Benny Boom to tell the rapper’s story. 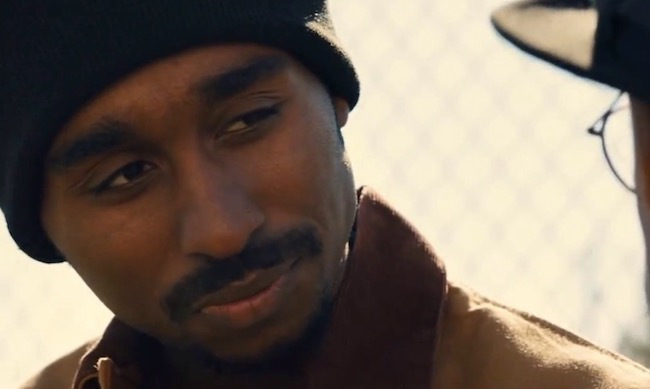 Every now and then, there are small hints to the depths and duality that made up Shakur’s character, portrayed pretty well by Demetrius Shipp, Jr. In what amounts to his first ever role in film, Shipp looks the part and generally displays good chops. Perfect? No, but there’s something there. Outside of a Tupac hologram assuming the position, probably the best we could hope for. However, he’s the one bright spot in a cast that does itself in with overacting. Pac was certainly a real one, but everyone around him here feels fake. 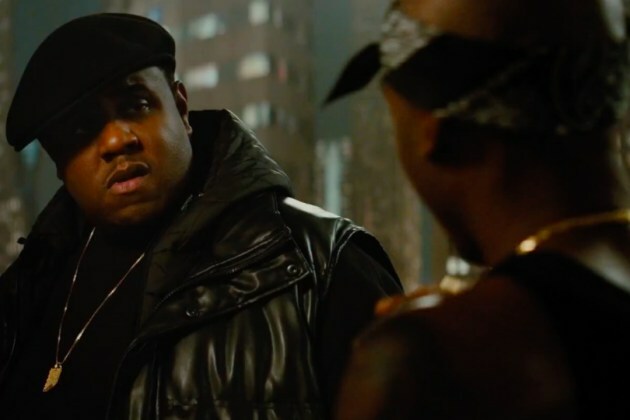 An aside: If Jamal Woolard can reprise his role as The Notorious B.I.G from a movie released over seven years ago, why couldn’t some small agreement come to fruition to bring back those who starred as characters in Straight Outta Compton who also make appearances in Tupac’s biopic? Every studio’s making shared universes, why not a multi-studio spanning “Rapverse” beginning with SOC and AEoM? The talent or lack thereof in All Eyez on Me is an issue, but the lackluster writing and general technical direction serve as bigger weights on the biography. Despite the semi-linear approach described previously for much of the movie, the film is poorly paced, often spending too little time on transformative moments, or too much time on inconsequential ones (a prison stabbing and a 10-second focus on a woman’s buttocks are examples of this). In about 10-15 minutes, ‘Pac goes from neighborhood poetry club contributor to Digital Underground roadie to signing with Interscope and releasing 2Pacalypse Now. The progression is jarring, and it ends up marring the rapper’s rise to stardom. There are two words I didn’t think would ever describe this movie. 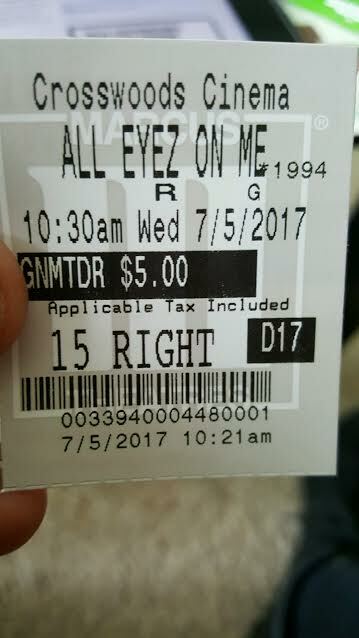 However, after viewing All Eyez on Me, much of the events and more accurately how they’re shown and told are rather cheesy and corny. Made for a reported 40 million, what’s here is on par with those straight-to-BET movies the station used to carry. At times, what occurs is unintentionally funny and/or just eye-rolling, with an odd reliance on slow-motion shaky shots. The ending is simply horrid. Benny Boom is a great music video director, but one does have to wonder if the directorial responsibility for a movie of this level would have been better in more experienced hands, as opposed to a man whose only directorial film credits are Next Day Air and S.W.AT: Firefight. For such a massive icon, Tupac deserves a better tribute in All Eyez on Me. Shed so many tears, indeed. Photo credits go to uproxx.com, BET.com, and xxlmag.com. This man’s legacy truly extends beyond music. I’m sad the biopic didn’t live up to the hype, but not really surprised either. It’s hard to really tell a story like his in the allotted time. Sidebar: do you have any clue how/why they decided to cast Woolard yet again? Not saying he isn’t talented, but as you mentioned why would they not reprise other actors in the same roles? Weird. I wonder it it was simple as “Hey, we can’t find anyone else who remotely looks like Biggie. Jamal, you want to reprise your role again (being that you’re not too active anyway) and make a quick buck? Can only surmise lol.